The Roosevelt Community Center in San Jose, A, a LEED gold building, was completed in Fall, 2008. My two installations here detain and filter storm water runoff from the roof. On the North side of the building, two water chutes channel the stormwater from the scupper and drop it onto the Thumbprint filter, a stainless steel sculpture based on the spiral forms of fingerprints, water and galaxies. The sculpture aerates the water as it drops into the rock basin below, where it is detained and filtered before flowing into a bioswale. A concrete seating wall surrounds the sculpture and contains a layer of.filtration rock that is two feet deep. This volume is large enough to detain and filter runoff from 5700 sq. ft. of roof area for a .5 inch storm. The Coyote Creek Filter, on the South side of the building, is a translucent rock filter that allows the infiltration processes that usually happen underground to be visible. It consists of an amber glass and stainless steel rock filter system, a stainless steel panel offset in front of it, and a 27 foot long planter. 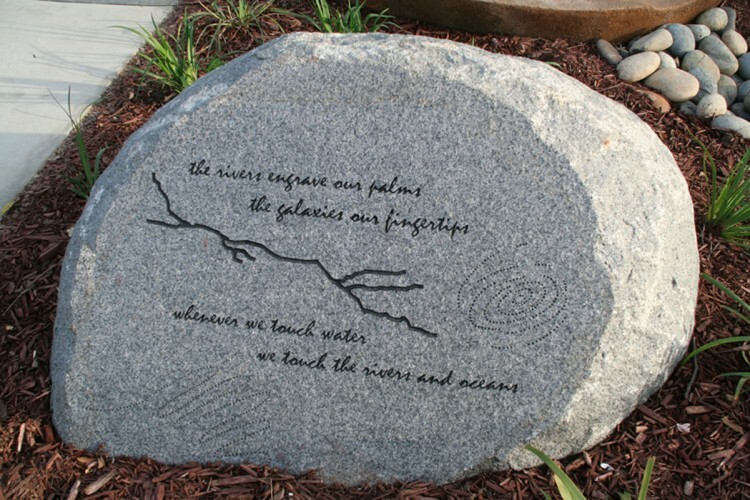 In order to suggest the link between stormwater runoff and nearby Coyote Creek, a map of the Coyote Creek watershed is etched into the glass and cut out of the stainless steel panel. It connects what appears to be separate, as all watersheds do. The filter is large enough to detain and filter runoff from 7800 sq. ft. of roof for a .5 inch storm. It is illuminated from behind at night. The book “Urban Rain,” published by ORO editions in 2009, documents the entire process of this award winning project from its conceptual foundations to completion, and sets it within the context of my previous work with urban stormwater. On the molecular spectroscopy of the greenhouse effect.